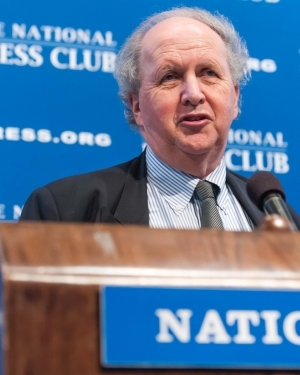 The prolific and popular writer Alexander McCall Smith kept a ballroom audience chuckling and laughing out loud Saturday as he made a case for novels that don’t focus on social problems. McCall Smith is touring the United States promoting and signing “The Limpopo Academy of Private Detection,” the 13th in the series focused on Precious Ramotswe, “the kindest and best detective in Botswana,” as the dust jacket says. In addition to this series, McCall Smith has written novels in four other series, short stories, and 21 children’s books. He is a co-author of several academic law texts. McCall Smith invited Tebelelo Seretse, Botswana’s ambassador to the United States, who was in the audience, to briefly share the lectern. “His books have shown how Africans can make Africa work,” she said. McCall Smith was born in the British colony of Southern Rhodesia, which is now Zimbabwe, and earned a Ph.D. in law from the University of Edinburgh in Scotland. His connection with Botswana began in 1981, when he helped found the University of Botswana and taught law there. He’s lived in Edinburgh since 1984, where he was a professor of medical law and is now an emeritus professor.